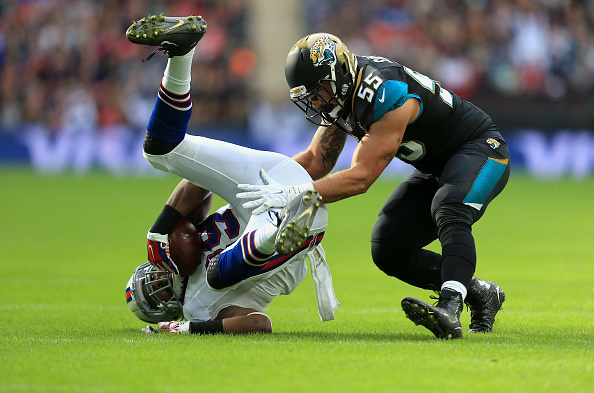 The Bills again Sunday were their own worst enemy in London, as E.J. Manuel wasn’t good as the Bills were upset by the Jacksonville Jaguars 34-31. Buffalo drops to 3-4 on the year as they enter their bye week. Manuel, for as bad as he played, was able to rally the Bills from down 27-3 to a 31-27 lead with 5:34 to play, but a suspect pass interference penalty gave the Jags life, and Blake Bortles hit Allen Hurns with a 31-yard score to put them up for good at 34-31 with 2:25 left to play. The Jaguars with the win are now 2-5 on the year. Bortles threw for 182 yards with two touchdowns and a pick. He hit Allen Robinson with a 10-yard score with the Bills up 3-0 just 51 seconds into the second quarter to make it 7-3. Disaster hit after that, as Manuel was hit and fumbled the ball, and Chris Clemons went in from 6 yards out to make it 14-3. It took seconds to make it 21-3 as Telvin Smith went in from 26 yards to give the Jags a big lead. Maunel threw for 298 yards, was sacked four times, and threw two touchdowns to go along with two interceptions. He led the Bills back from down 27-13 at the half with a 58-yard TD pass to Marcus Easley and a two-point conversion from LeSean McCoy to make it a 27-24 with 6:42 left. Corey Graham gave Buffalo the lead, as he picked off a Bortles pass and went 44 yards to make it 31-27 with 6:42 left. After the took the lead their defense couldn’t stop Bortles and the interference penalty was a huge swing on the game-winning drive for the Jaguars. McCoy ran for 68 yards in the losing effort for Buffalo. Robert Woods had 84 yards through the air with a score for the Bills. The Bills outgained the Jaguars 375 to 295, but it was all for not as they come back to the states a game under .500 at 3-4.